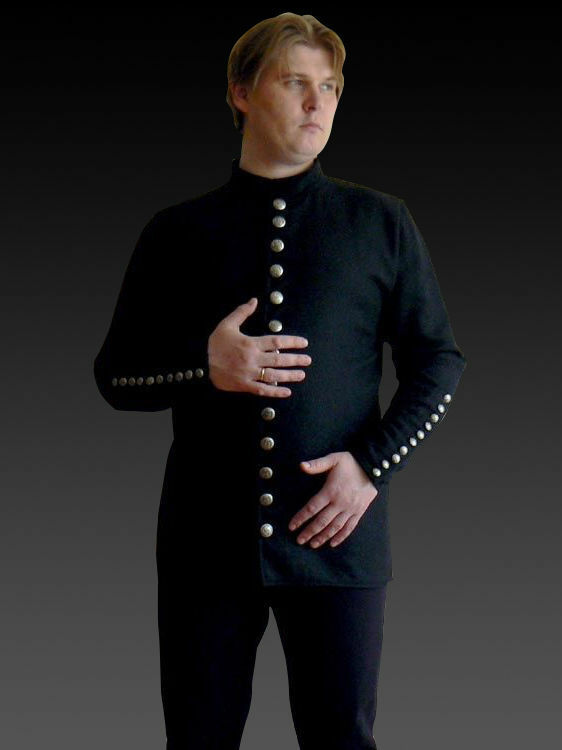 Medieval doublet of XV century with stand-up collar has 13 metal buttons for fastening in front and 10 buttons on the each sleeve. Base price includes lining, made of cotton. The specific feature of this medieval underdress is a skirt, that flares out. Both sleeves have cuts that are fastened with 14 buttons (on each sleeve). The lacing on the sides and round neckline accent an elegancy of outline. This underdress is made of 100% natural cotton, linen or silk and goes perfectly with English dress of the 2nd part of XIV century. Different colours are available for order. Please send us your wishes for colour and textile to [email protected] .. In medieval Europe the shirt was the main element of any man's costume. This model is characterized by democratic cut with a round neckline. Long sleeves and the neckline are bordered with a simple stripe on the edges. The shirt is being made of 100% natural fabrics: linen, cotton, wool, velvet or silk. Different colours are available for order. This shirt is presented in the classic colors. It can be worn as a separate item with a belt and without one and completed with a tunic or different gambeson. .. This costome of noble warrior of the XII-XIII century includes the following items: -braies -chemise -chausses -cotta -gambeson -padded cap with pelerine Short overknee chausses are tied with leather or fabric string. Long cotta has a cut from the front, that provides with a good mobility. Neckline and sleeves are decorated with thread of contrast colour. Gambeson with mittens is sewn according to the historically correct patterns. You can see the similar model on the medieval miniatures and in Maciejowski Bible. Gambeson has cut from the front and leather string for fastening on the collar. Padded cap and pelerine are joined with leather strap, but you can use them separately. Base material of costume is 100% natural cotton. For padding we use sheet-wadding (50% wool, 50% cotton). ..
Italian costume of the XV century looked similar to the Burgundian suit, but did not have the same sharp silhouette, so it considered to be more comfortable. This model of medieval costume is sewn according to the historically correct patterns and keeps the main details of Italian man’s garb: colourful tight chausses, short doublet, puffed sleeves. Costume includes the following elements: - Undershirt and braies. Underwear is made of thin white batist (100% cotton), which is very nice and soft to the body. - Doublet. Woolen doublet with puffed sleeves has laces with brass points from the front and on the wristbands. There are holes uder armpits, as sleeves are sewn to the sleeve caps; - Chausses. 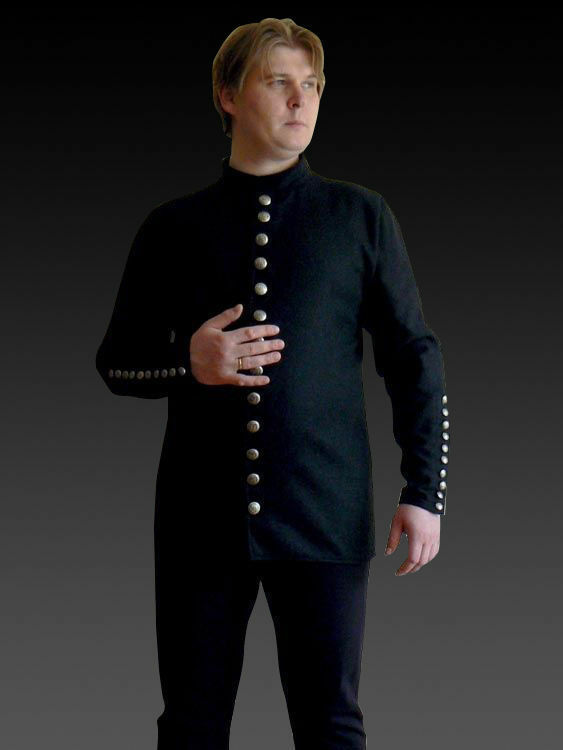 Tight woolen chausses with codpiece are fastened to the doublet with strings with brass points. To make doublet more comfortable, you may choose linen or cotton for lining in options. Base price includes chausses and doublet made of wool, without lining. Please send us the wished colour combination to sales..